Over the past week, I received the feedback from several readers about Now, Returned to India. Some read one or two chapters, others read the entire book. And their feedback was an eye opener. First, a word of thanks to the beta readers. They not only took the time sample chapters or the manuscript, but they were also kind enough to point out what worked and what didn’t work about the draft. Some even took the extra effort to comment section by section and sent the word document back by email. I am summarizing the overall feedback below. 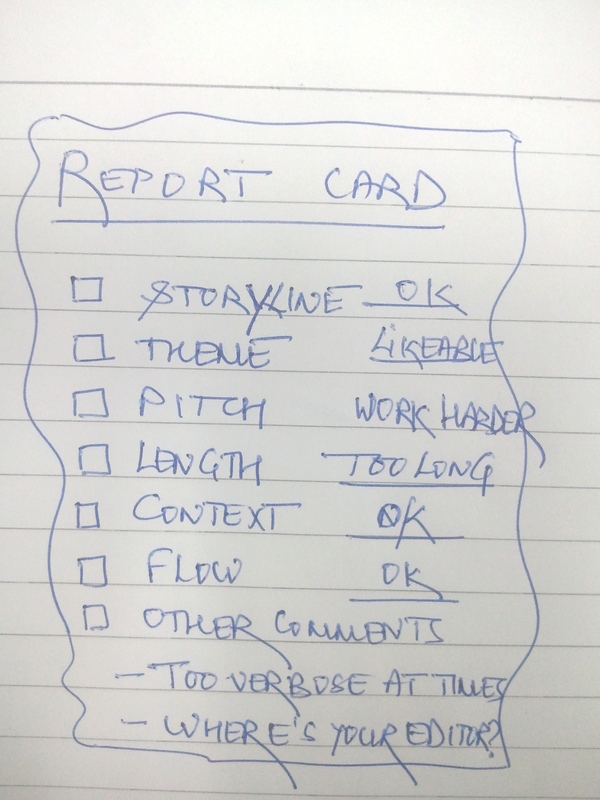 I’d like to call it my book’s “Report Card.” The good part is, that it is for the Beta version, so there is room for improvement. The above is just a summary, and specifically, I was told that the OK’s can be upgraded to ‘Good’, once the grammar and the typo’s are addressed. But I took the “too lengthy” and “too verbose” comments seriously. And before sending the draft off to the editor, I worked on the manuscript one more time. Note that I had acknowledged that the draft had not been sent to a professional editor and the reviewers were aware of it. I spent the nearly an entire week making the manuscript more concise. It was a lot of work, and I learnt a lot about brevity. A dear friend of mine had cautioned me – he said “use a scalpel and not an axe” while reducing the wordcount. The manuscript now down to about 78,000 words from 98,000. In other words, nearly one fifth of the words were either redundant or the sections weren’t really adding value to the story. That was the most important learning for me from this process. On a positive side, the comment “Improve the pitch” led to an unexpected bonus- I was able to submit the manuscript for Amazon’s Breakthrough Novel Award. Next Post How did I approach beta readers to review my novel? Good for you! I am very interested in hearing how and where you got people to review your book. Thank you so much for sharing! Thanks for your message. Other than friends and family, I approached my alumni network (some in the network are writers themselves). Also members of an online community. Last but not the least I spoke to random people- strangers, who are booklovers. The last in particular was a very interesting experience to say the least. Hope this is helpful.